Howlett's Bus Company was founded in Quorn by George Howlett in the early 1920s. The depot was on Barrow Road. 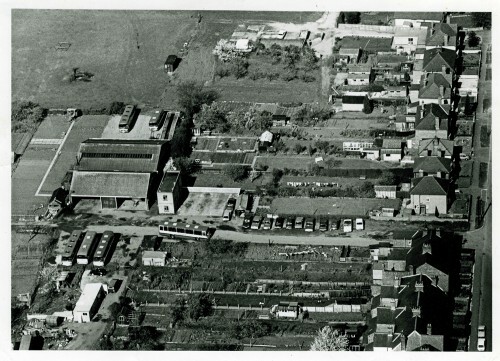 This aerial photograph was taken in the late 1970s. On the right is Barrow Road. The entrance to the depot was on the left about half way down (as you go in the Barrow direction). This is beyond Farnham Street and White Street. The private road/track still exists, it is between numbers 92 and 94 and can be clearly seen on the photograph. The actual depot was round the back of the houses, where Freeman's Way (part of the Farley Way Estate), is today. In later years Howlett's was owned by the Noon family, before finally being taken over by Tricentrol in 1979. For a long time the Howletts lived at 92 Barrow Road and the Noons at number 94.